MIAMI - On this Monday morning, NHC is monitoring two disturbances over the tropical Atlantic Ocean. 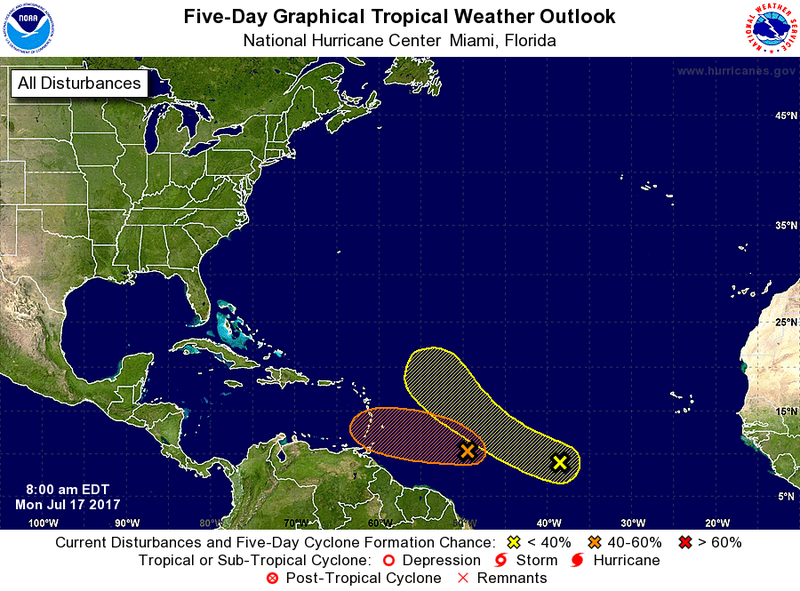 One is an area of low pressure located about 750 miles east of the Windward Islands, moving westward at about 15 mph. The associated shower and thunderstorm activity continue to show some signs of organization, but the system appears to lack a well-defined center at this time. Environmental conditions are conducive for some additional development before the system reaches the Lesser Antilles late Tuesday or early Wednesday. After that time, less favorable upper-level winds are expected to hinder additional development. Regardless of development, this system is expected to bring locally heavy rainfall and gusty winds to portions of the Lesser Antilles beginning late Tuesday. An Air Force Reserve reconnaissance aircraft is scheduled to investigate the disturbance this afternoon. Another area of disturbed weather is located about 800 miles west- south-west of the Cabo Verde Islands. Some gradual development of this system is possible over the next few days while it moves slowly toward the west-northwest or northwest over the open Atlantic Ocean.